Located along the Snake River Plain in central Idaho, the Craters of the Moon National Monument and Preserve protects major volcanic and flood basalt regions in the western United States, offering a variety of public hiking trails and backcountry wilderness experiences. The 618-square-mile Craters of the Moon Lava Field is the largest basaltic lava field in the contiguous United States, containing more than 60 solidified lava flows ranging in age between 15,000 years and 2,000 years old. 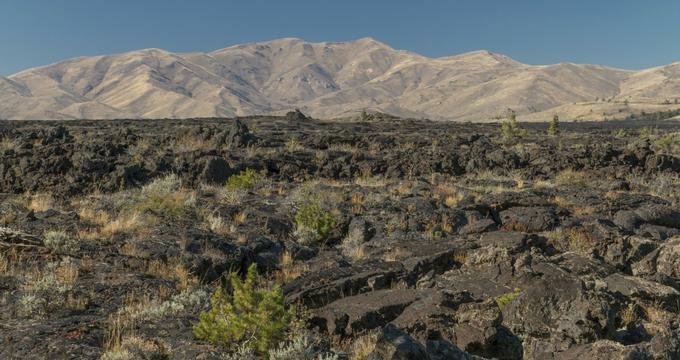 The field was formed from activity within the 53-mile Great Rift volcanic zone and is part of the Lava Beds of Idaho geographic region within the Snake River Plain. The most recent eruptions from the lava field, which ended approximately 2,100 years ago, were believed to have been witnessed by the Shoshone indigenous people, whose legends of serpents causing mountains to spew liquid rock and fire correlate with the activity of volcanic eruptions. Throughout the 19th century, pioneer travelers on the Oregon Trail utilized the Goodale’s Cutoff pass to avoid the area’s open lava bed regions, and in 1879, the first known scientific exploration of the lava fields was undertaken by Arco citizens Arthur Ferris and J.W. Powell. Subsequent explorations were undertaken 19th-century explorers, who began to note the area’s physical similarity to the moon’s surface, coining the nickname “Craters of the Moon” in 1923. The nickname was used by explorer Robert Limbert in National Geographic in 1924, raising public awareness and popularity of the fields, and the creation of a national monument was suggested for the area’s protection. In May of 1924, President Calvin Coolidge issued the creation of the Craters of the Moon National Monument, and a number of visitor amenities were constructed in the area throughout the mid-20th century, including a visitor center and hotel and cabin accommodations. The monument’s area was enlarged several times throughout the 1960s and 1970s, with more than 43,000 acres being protected as a wilderness preserve in 1970. Further expansions were added to the monument in 2000 through the advocacy of geologists and environmentalists. Today, the Craters of the Moon National Monument and Preserve is managed and maintained by the National Park Service in cooperation with the Bureau of Land Management. Three major lava fields are preserved within the monument area, which spans a total of 1,117 square miles. Over 25 volcanic cones are showcased throughout the park, including a number of spatter cone formations, and the Kings Bowl and Wapi lava fields are preserved in their entirety as part of the park’s National Preserve area. The monument is located near the cities of Arco and Carey and is accessible from United States Highway 20, featuring a single paved road along its northern end for vehicle exploration. The park’s Robert Limbert Visitor Center serves as its main visitor entrance point, offering park information and a variety of educational exhibits about the area’s geology and history. A short orientation film on the lava beds is shown periodically throughout the day at the Center’s theater, and ranger-led walks are offered throughout the summer months embarking from the Center, focusing on a variety of geology and natural history topics. A bookstore operated by the Craters of the Moon Natural History Association is also offered, along with restrooms and other visitor amenities. A number of geologic attractions and walking trails are showcased along the park’s 7-mile Loop Drive, including the ¼-mile paved North Crater Flow Trail, which showcases the North Crater Lava Flow, and the ½-mile Devils Orchard Trail, presenting a grouping of cinder cone fragments, commonly referred to as monoliths. Interpretive displays showcased along the trails explore the impact of human activity on the area’s geology and biodiversity. Other major stops along the loop include the Inferno Cone Viewpoint, the Big Craters and Spatter Cones area, and the Tree Molds area, which offers a moderate-difficulty six-mile wilderness trail. Lava tube caves are also accessible from the loop’s Cave Area, including the Dewdrop Cave, Boy Scout Cave, and Indian Tunnel formations. Backcountry exploration opportunities are also offered for more adventurous visitors within the monument’s roadless southern portion. 51 campground sites are located throughout the monument and preserve, which are offered on a first-come, first-served basis. A variety of educational opportunities are offered for elementary and secondary school student groups, including ranger-led field trip programming, teacher lesson plans, and Teacher-Ranger-Teacher professional development continuing education programs. A Lunar Ranger program also offers badges for young visitors in exchange for completion of park activities. A number of public programs are offered throughout the year, including ranger-led hikes and evening programming at the campground’s amphitheater.